Every year, we make a mad dash to our calendars when the annual Sweets & Snacks Expo is announced, because the annual Sweets & Snacks Expo fills part of the largest convention center in the country with candy and snacks, and then hands you a bag to fill up. (Okay, the real purpose of this sugar-fueled bacchanal is for candy companies to meet up with retailers and do business, but for us it’s like Halloween with no kids, and lots of candy that isn’t in stores yet.) The A.V. 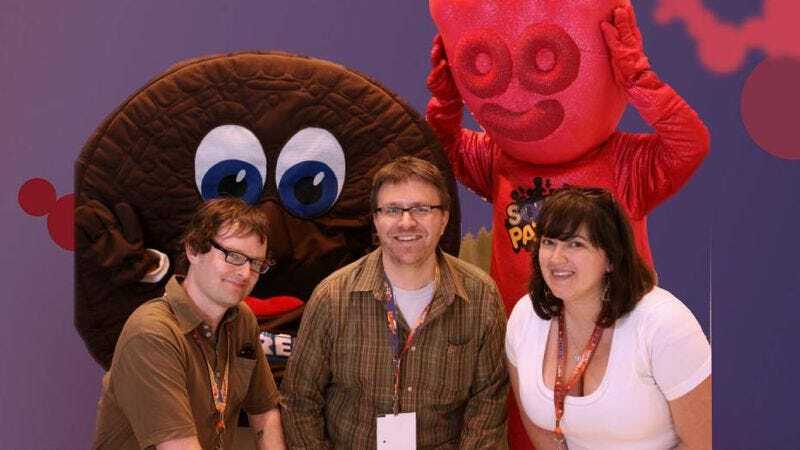 Club has been making the pilgrimage to Chicago’s McCormick Place for the past five years or so, and we’ve seen it all: mascots, statues made of Jelly Belly jelly beans, Christian lollipops, various NASCAR drivers, and mountains of candy. We even saw a frenzy at the Ferrero Rocher booth one year at the tail end of the show, when all of the big samples were unleashed from their protective wrapping. This year seemed slightly lower key than years past—where were the guys dressed as M&Ms?—but it was nonetheless glorious. Here’s a wrap-up of some of the new and notable items that we picked up this time around. In a continuing bid to not be your daddy’s candy company, Russell Stover has introduced some wacky items over the past few years, including the S’Mores Big Bite, which is basically a non-campfire s’more, individually wrapped. It’s tastier than it looks. Now they’ve introduced the incredibly heavy Caramel Apple Big Bite, which is supposed to mimic the flavors of a caramel apple—one version has peanuts, the other does not. If you like fake apple flavor—I do—and chocolate-covered caramels (and excess), these will delight you until they crush you. Each weighs 2.25 ounces, so it’s like eating a huge chocolate turtle, but without the benefit of pecans to balance out the heavy caramel. Peeps are as old as candy itself—the sugar-covered marshmallows came from the same laboratory as lollipops and caramel. (This may not be entirely accurate.) But they’ve been bold with new flavors in the recent past, introducing chocolate-dipped Peeps (yummy) and Gingerbread ones (not so good). This year it’s Sweet Lemonade, which, true to its name was insanely sweet, and Bubble Gum, which I have to admit I didn’t try. We were disappointed that the Peeps booth did not have samples of the new Birthday Cake-flavored Peeps, but alas, maybe we’ll track some down on the way to our blood transfusion. A Klondike Bar, as any red-blooded American should know, is ice cream dipped in chocolate, and it’s been around since the 1920s. Though it has been through many iterations, the basic idea has stayed the same. But perhaps in a late response to the candy bars that introduced ice-cream-bar versions—Twix, Milky Way, etc.—Klondike is now a bite-sized candy, available in two flavors: caramel and mint chocolate, neither anywhere near as satisfying as an actual Klondike Bar. It’s too chewy and dense, and also it’s not ice cream. The exclamation point, by the way, is theirs. There’s a restaurant-review TV show in the Chicago area whose intro features a guy extolling the virtues of his favorite restaurant with this line: “They got a mozzarella cheese there that’s stuffed with… more mozzarella!” And I can’t stop thinking about that ridiculous idea when I look at the M&M’s Chocolate Bar, which is basically a chocolate bar with some tiny M&M’s mixed in. Inside the M&M’s is the exact same chocolate that surrounds it. There’s a tiny bit of crunch, but no added flavor. It’s still a chocolate bar, and there’s nothing in the world wrong with that, but thinking about it too hard makes me not want to eat it. This is a lollipop that’s supposed to taste like candy corn, and its greatest virtue is that it’s not completely disgusting. It’s actually very subtle, as if the flavor-lab guys got scared and backed off what could’ve been a nightmare. Instead, it looks terrible but tastes inoffensive—which means it’ll appeal to neither kids nor adults. Denver-based candy company Hammond’s always puts out some of the show’s weirdest and/or most delicious taste combinations, like s’mores candy bars or bars with bee pollen in them. This year, Hammond’s was slinging two new products: A red velvet chocolate bar and something called Pigs N’ Taters. The former was named the most innovative new product at the show, but it’s a little underwhelming in practice. There’s a ganache in the center of the red chocolate bar that’s supposed to taste “remarkably like its namesake,” but really, it doesn’t taste like much of anything. Maybe it needs a side of cream-cheese frosting for dipping? Pigs N’ Taters is a different, more flavorful story. Packed full of potato chip crisps and vegetarian bacon bits, the bar is definitely a unique taste experience. The bacon bits might seem like a weird choice, but their lack of grease makes the bar just the right crunchy consistency. The concept is a little disgusting—bacon and chips in a candy bar—but it’s pretty tasty. All that being said, the fake-bacon scent is a little off-putting. Given a choice, I think I’d go with Sanders’ potato chip bar in the future. Like their colonizing pals over in Britain, the Canadians have long been innovators in the flavored-chip realm. New Brunswick-based Covered Bridge makes 25 varieties of kettle chips, from plain old sea salt and vinegar to cinnamon and brown sugar sweet potato chips. The A.V. Club opted to pick up two of the company’s newest offerings: kettle chips with something called “Montreal steak spice seasoning” and others flavored like Atlantic lobster. While the former taste less like a steak than the name would suggest, they do boast a pretty tasty mélange of savory seasonings (listed mysteriously on the packaging as “spice”), making them almost cripplingly addictive. The lobster chips, on the other hand, taste less like seafood than they do like fish food. Gross. Wheat Thins don’t need much gussying up to be good. And although its attempts at adding flavor powder have been mixed—Sundried Tomato & Basil does a superb job of accidentally recreating the taste of pizza—its attempt at Chili Cheese certainly succeeds. The chili spice is subtle, only making its presence felt if consumed en masse, while the cheese is apparent at the finish. It’s a well balanced snack cracker, and by the time I reached the bottom of the packet I wished there were a few more to kick back. Companies that deal in fruit-flavored snacks live or die by their ability to recreate distinct, organic tastes, and Skittles has carved out a well-defined brand over the years because of this. It has occasionally dipped into specialty-flavored packs, but its flagship has always been the original rainbow-colored pairings. Now that’s changing as Skittles removes the lime from the Original, replacing it with green apple. It’s not that jarring a change, and more of a small tweak then a complete overhaul. Lime isn’t gone entirely though, instead it finds its home in Skittles Darkside, which is another similar-but-different offering. Here the lime flavor reappears seemingly unchanged aside from its new name, Midnight Lime, and its berry-centric set of companions. Packaged with it are Dark Berry, Forbidden Fruit, Pomegranate, and Blood Orange, and by-and-large they succeed, aside from the dreadful pomegranate flavor, which has an overstated earthiness to it. Kraft Foods’ triangular Swiss chocolate bar now has a slight—very slight—variation on its original honey-and-almond-nougat flavor. The triangular turquoise box says that it’s “Swiss milk chocolate with salted caramelized almonds and honey and almond nougat,” but for all those ands, there’s not a lot new going on here. The chocolate is predictably milky and delicious, but the caramelized almonds and nougat are ground up into little pieces that mostly sink to the bottom of the peaked chocolate. The nougat can get a bit tacky—I actually thought there was toffee in it at first, though that’s not necessarily a bad thing—and neither the caramelized almonds nor the salt has a distinct flavor profile. Still, I nibbled away at the peaks a little too quickly, so Toblerone has clearly found a salty sweet-spot. Because everything tastes better with rooster sauce, Sugar Plum Chocolates created an otherwise plain chocolate bar with a kick. There are no frills: no pretty molds, no perforations to let you know where a serving size ends, no nuts swirled in. It seems like a plain chocolate bar—the label says dark chocolate, but it’s more sweet than bitter—until the little red Sriracha bits burst in your mouth. The aftertaste is pleasantly punchy but won’t overwhelm most people’s taste buds (disclaimer: I like very spicy food, but this is really pretty mild), though the chili bits, just like Sriracha, do linger a bit. If you like your chocolate spicy, this’ll hit the spot, but there’s plenty of more nuanced spicy chocolate bars to be found. Fans of German chocolatier Ritter Sport who prefer dark chocolate have had to settle—that’s not quite the right word for a company that makes such delicious candy—for Ritter Sport’s 50 percent cacao bar, but now they no longer have to endure such tyranny. The new Edel-Bitter bar sports 73 percent cacao, which nicely balances people’s desire for darker dark chocolate but keeps it well within the palatable range. It’s not overwhelmingly dark, but just in case, the thoughtful Germans have subdivided the Ritter Sport squares into 36 smaller squares. It’s not necessary for the flavor, but maybe it’s helpful for portion control? Or maybe it’ll just make people feel guilty for eating even more squares. Companies have been trying to build a better tortilla chip for years, mostly to enhance dipping, but El Sabroso has abandoned such pretense: Its Taco-Litos roll the chips like small, corn-based cigarettes. Spicy Chile N’ Lime douses the chips in neon-red food coloring and what @DadBoner would call “bold flavors.” The chips have a satisfying crunch, and the flavor is tasty if overwhelming after awhile. Some desserts shouldn’t be mass-produced, and brownies have proven to be one of them. Betty Crocker attempts to mitigate its brownie’s sterile, lackluster flavor with a ribbon of caramel, but only succeeds in adding calories and fat to something that didn’t need help in that department. Step up your game, Betty, if you’re bringing brownies to the city that created them. A few exhibitors at the Sweets & Snacks Expo were offering some kind of popcorn chocolate bar, but Venezuelan chocolatier Chuao—always an A.V. Club favorite—is the only one that chose a less literal approach. Instead of cramming popcorn pieces into a bar, it combined a popcorn flavor with Pop Rocks-esque popping in a milk-chocolate bar. (Chuao used the popping element well in its Firecracker bar, deliciously blending it with dark chocolate and a slight chipotle flavor.) The bar drew a lot of quizzical first impressions from people around the Onion Inc. office—the popcorn flavor is really subtle—but the bar was quickly devoured. The tagline for this new pizza-flavored hard candy is “It’s not just a candy…it’s a snack!” But with no sugar, sodium, gluten, carbs, or fat, it seems like a genetically engineered health item more than either candy or snacks. That, and it’s a horrifically pungent concentration of generic vegetable flavor that will stink up an entire room when someone puts a piece in their mouth. Nobody who was brave enough to try one actually made it through an entire piece before spitting it out once the flavor attacked the taste buds with the power of 100 cans of V8 concentrated down to the size of a butterscotch hard candy. Savory candy has worked before as a curiosity, but trying to condense pizza flavor has to combine buttery bread, tomato, cheese, and meat into one tiny piece of candy. Pizza Is 4 Suckers makes the wrong assumption that tomato flavor should be the overpowering note. Maria Sharapova may not be a perennial tennis champion thanks to the Williams sisters’ continual dominance of the sport. But she’s a visible, successful player, apparently enough to get her own line of candy. Because when you think Maria Sharapova, you think of chalky, tennis ball-shaped chewing gum. A portion of every purchase goes to the Maria Sharapova Foundation, so it’s kind of for charity—never mind that athlete-run charities are notoriously inefficient—but there’s no reason to get this over a decent pack of Trident or 5, even with the novelty of the shape.